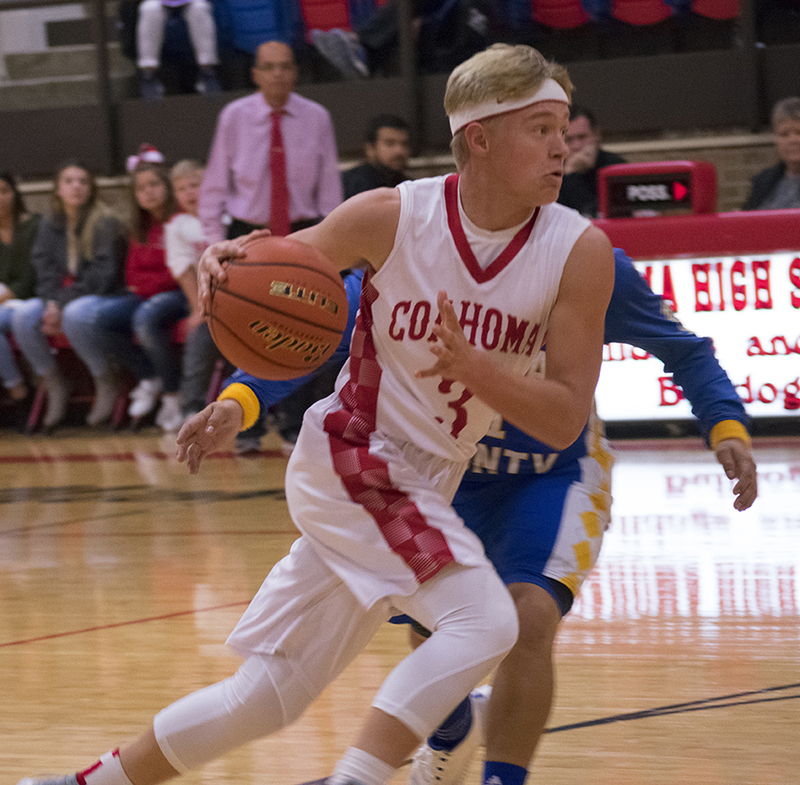 COAHOMA — Gage Clark netted two 3-point goals in the fourth quarter to help salt away the Bulldogs 39-27 victory over the Reagan County Owls Tuesday night. The Coahoma High School senior had a game high of 13 points at the board with most of his baskets coming in the second half. Coahoma nabbed the first score of the match and never looked back leading throughout the game. By the half, the Bulldogs had a 6 point advantage over the Owls. Although scoring on both sides was slow in the second and third quarter, the game pick up in the fourth. Clark started off the quarter burying two shots behind the arc and added two more points to the scoreboard to increase the lead 33-20. Braxton Chandler dropped the ball in under the post for 2 and Joe Manning finished off the game for Coahoma with a flourish by nailing two free throws and later completing a layup for 2 more points with 1:02 left in the game. Manning brought in a total of 8 points for the night. Next the Bulldogs will head to Stanton to compete in the Hooptown Classic. Coahoma faces off against the Stanton JV at 1:30 p.m. Thursday. Earlier in the evening, the Bulldog JV team won over the Owls 32-16. Coahoma — Brice Martin, 2; Braxton Chandler, 4; Joe Manning, 8; Zack Schneider, 5; M. Martinez, 2; Gaige Hill, 2; Bryson Cline, 3; Gage Clark, 13. Reagan County —Jaden Gonzalez, 9; Seth Hernandez, 3; Isaiah Perez, 2; Pablo Hernandez, 5; Isaac Perez, 2; Jacob Gallegos, 2; Justin Chavez, 4. Free Throws — Coahoma, 5 - 12; Reagan County 7 - 9; Three Point Goals — Coahoma 2 (Gage Clark); Reagan County 2 (S. Hernandez; P. Hernandez); Total Fouls — Coahoma 17; Reagan County, 10.